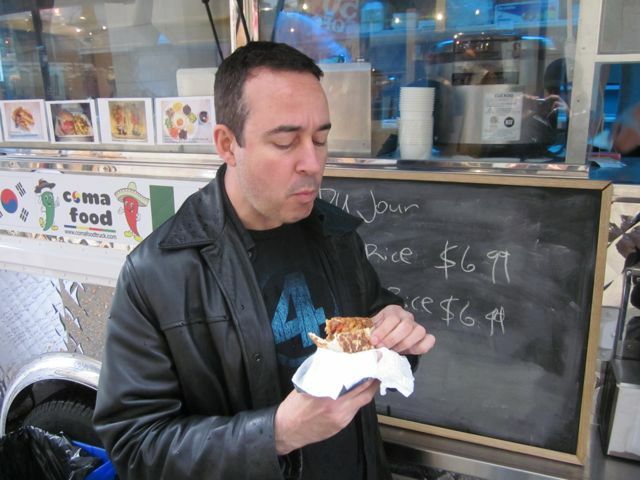 Joseph Mallozzi's Weblog: October 21, 2011: Birthday Memories! 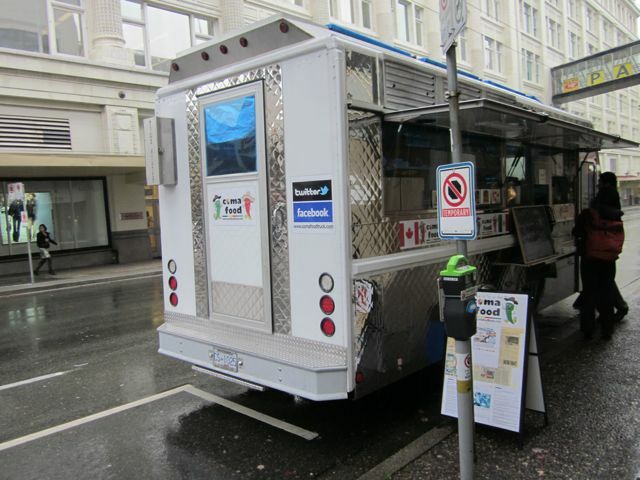 The Great Vancouver Food Truck Tour II! October 21, 2011: Birthday Memories! 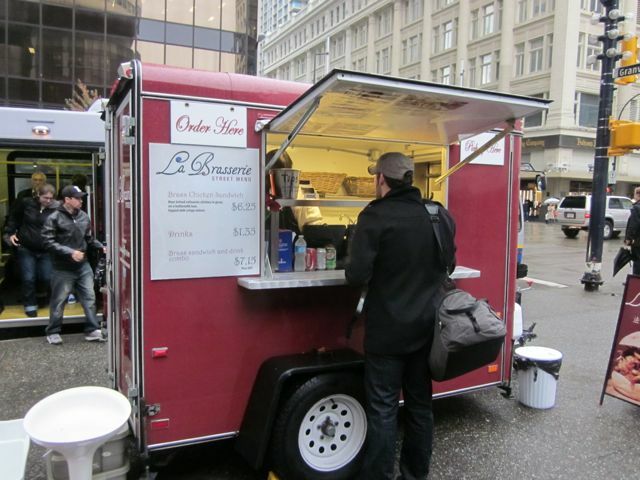 The Great Vancouver Food Truck Tour II! Let me set the next clip up for you. I was working on Stargate and it was my birthday. I made it very clear that I didn’t want anyone in the office to do ANYTHING for me and that included: the purchasing of gifts, the presenting of cake, the singing of Happy Birthday – or any variations thereof. After lunch, I noticed people milling about the kitchen. A bad sign. So I retreated to my office and shut the door, locking it just to be sure. Seconds later, I received a call from my assistant, Ashleigh. I ignored it. She tried again. Again, I ignored it. Another call – this time from Carl. Sneaky, sneaky. I ignored that too. Not to be dissuaded, they marched down to my office and knocked. I ignored them. So Ashleigh used the master key to open the door and let everyone in. BTW – This clip and the one I posted yesterday of the first screening of SGU’s Time come compliments of Lawren Bancroft-Wilson. 0:07 – My co-workers cry “Speech! Speech!”. This is payback for the numerous times I’ve done the same thing, calling out for a speech – not because I want to hear one, but because it makes the moment all that more awkward for the birthday individual. 0:54 – “Take a picture of the crappy cake.” A reference to a blog post in which I criticized the quality of the office birthday cakes. 1:10 – Ashleigh never did get around to cleaning my desk. I had to do it myself! 1:33 – Ashleigh’s excuse for just walking in “You were sitting there. I could see you.” sounds perfectly acceptable if not for the fact that the blinds were drawn, meaning she would have had to peer through the tiny opening between the slats. Creepy! 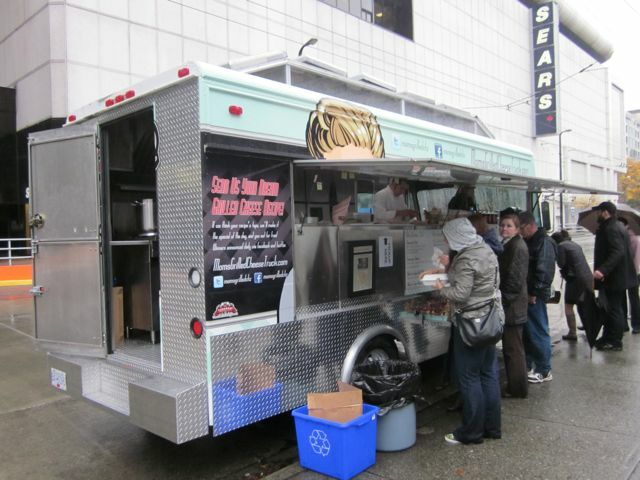 Speaking of creepy Ashleigh, she was unable to join us today for round #2 of The Great Vancouver Food Truck Tour. Lawren was also conspicuously absent, claiming he had to be somewhere (L.A.). Fortunately, Akemi had nowhere else to be and we were joined by professional eater Ivon R. Bartok for the occasion. 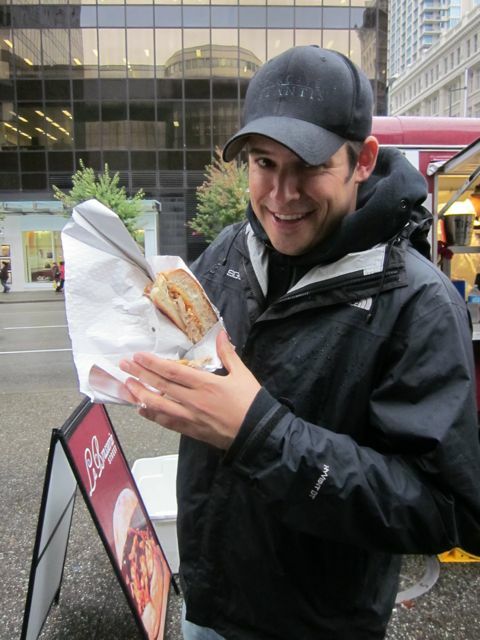 It was rainy and cold, but that didn’t deter us from hitting another five food trucks! First stop: La Brasserie (not to be confused with La Brasserie 2 which we hit last Friday). 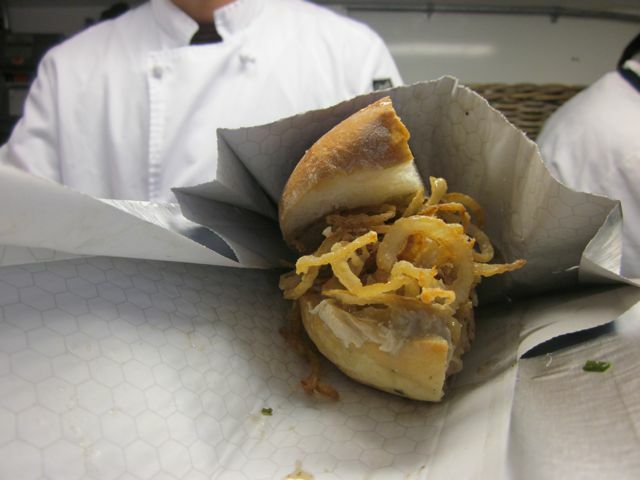 A chicken sandwich with gravy and crispy onions. A terrific start to the tour. A little messy but quite tasty and the crispy onions offered a wonderful textural contrast. Ivon paced himself, only eating roughly half of everything. After all, speedo season is right around the corner. 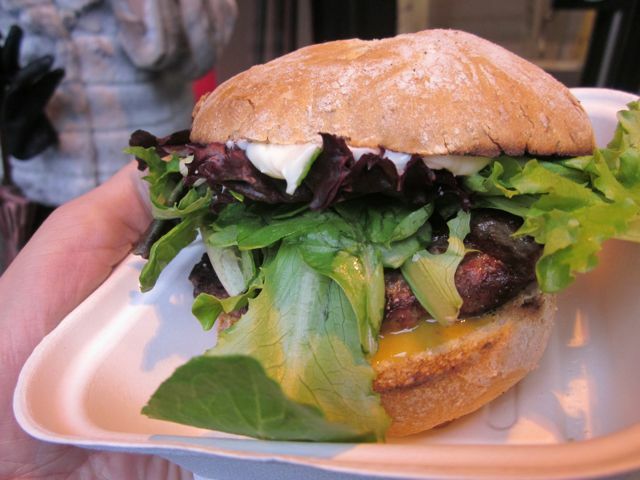 The venison burger served with greens and a sweet honey mustard. Game meat is tricky to prepare as it tends to dry out quickly, but the venison was moist and tender, the honey mustard a nice compliment to the savory grill flavor. Akemi was reluctant to try it at first but ended up by finishing it off. If they're not flying Santa's sleigh, Ivon is eating 'em. Next up was Coma Food, a place that offers a contemporary spin on Korean cuisine. As we awaited our order, we were served complimentary Korean miso soup (very good although I only got to finish half of mine before Akemi helped herself). 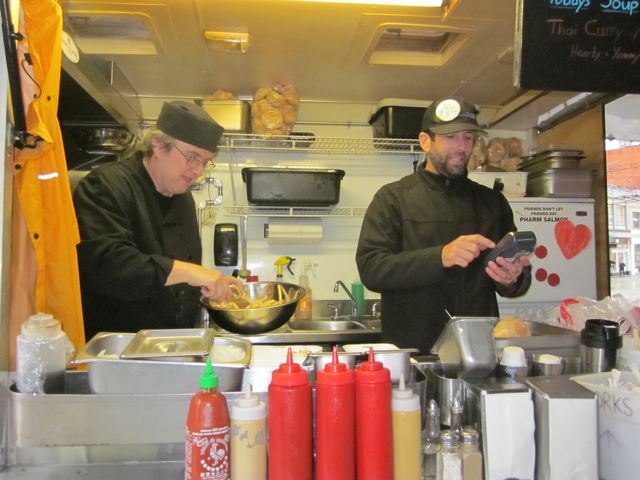 We chatted with the truck’s owner, Jay, a transplanted L.A. native who gave us the lowdown on his fresh ingredients including his home made marinade. No pre-packaged offerings here. 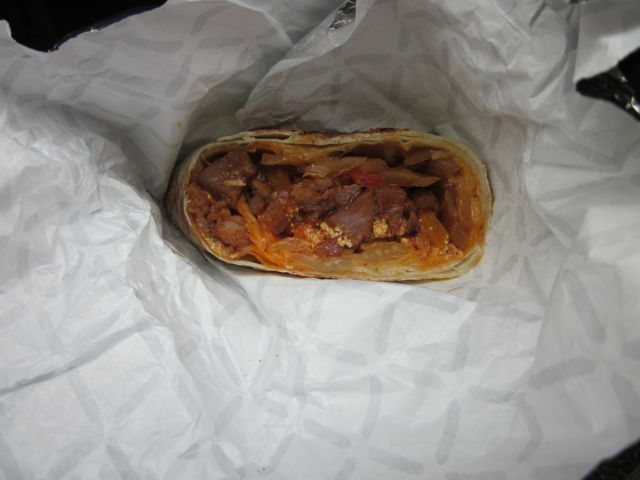 We had the spicy pork burrito and it was probably the best thing I had all day. Sweet and spicy with a nice crunch. What I at first took to be egg turned out to be tofu. Although he really liked the burrito, Ivon wasn’t a big fan of the tofu (“There’s no reason to add tofu to anything.”) but Akemi loved it. For my part, I didn’t mind it as it simply took on the flavor of the accompanying elements. 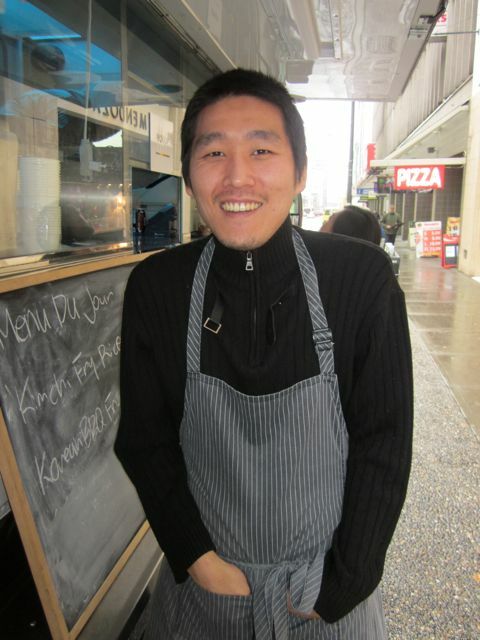 I’m already planning a return visit to check out the Bulgogi Burger. I do a better job of sampling the burrito than Ivon who took a bite and had it explode in his face. Another contemporary spin on Korean cuisine! And another proud owner of a home made marinade (which included pears and brown sugar) and slow-roasted meat (10 hours if I remember correctly). 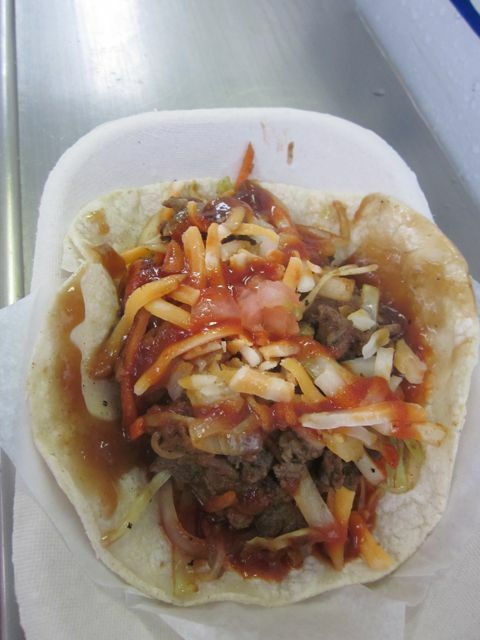 The Bulgogi Taco. I ordered spicy and it delivered a really nice kick. A little messy, but quite good. 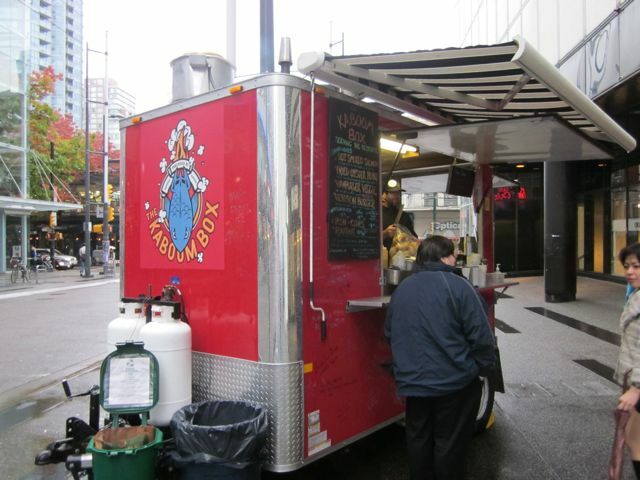 The busiest of the food trucks we visited on the day. The inclement weather did nothing to discourage customers, most of whom were clearly regulars. Unfortunately, I forgot to get pics of the menu items. I had the Jackson 3, a triple cheese, triple decker creation of sourdough, melted triple cream brie, boursin, and gruyere. And, for dessert, the Fat Elvis: peanut butter and banana with smoked sea salt on white bread. The Jackson 3 was good but I felt the sandwich missed the bite that, say, a cheddar could offer, meaning I’ll have to go back for the straight cheddar version. A customer beside us seemed to be enjoying hers immensely. The Fat Elvis, alas, didn’t really impress. I commend them for using all natural peanut butter instead of the sweetened versions but, as Ivon pointed out, the sandwich could have benefited from a little honey. Yet another successful food truck tour. That’s ten trucks down, approximately forty more to go! Ivon keeps his spirits up (and belly full) amid the downpour. 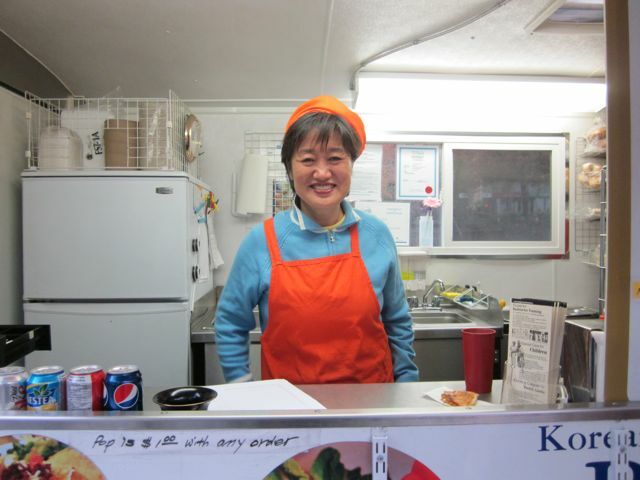 Akemi, all smiles and sunshine - despite the lack of sunshine. Ivon and I spitballed ideas for a new show. We’re taking a few days to think about it, then reconvening next week to discuss! Very exciting. We’ll tell you all about it. Eventually. Previous Article October 20, 2011: Commissioning a masterpiece! A Stargate: Universe screening! My near future plans: a novel idea! Trevor’s fine. Really. Next Article October 22, 2011: Dinners, projects, and Snow Monkeys! Joe you look so much younger in that birthday video. How many years ago was that? Ten? Twenty? Maybe it is just the dark suit. When did you quit wearihg your suits to work? You look so good in them. Very handsome! Ohhhhhhh! I almost cried! Cruel Ivon! See. That’s what happens when you eat Santa’s reindeer! Justice. 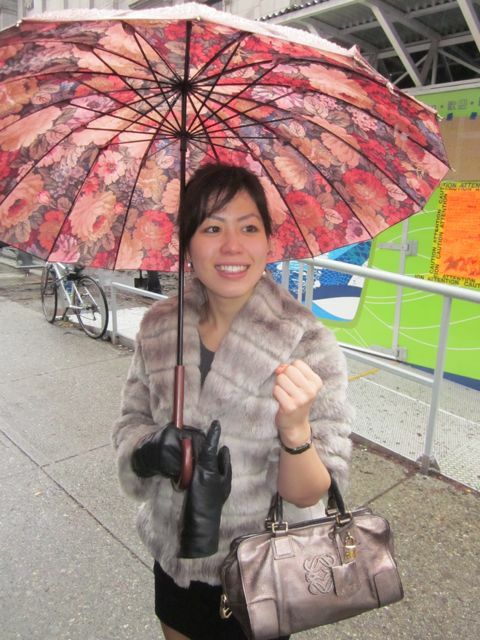 Akemi looks gorgeous in her jacket, purse, gloves and umbrella. She looks like a movie star! Oh, yes, right. Ivon in speedos. Um…could we get a picture of that? Our fingers, toes and paws are crossed hoping it will be a sci-fi show of some sort. 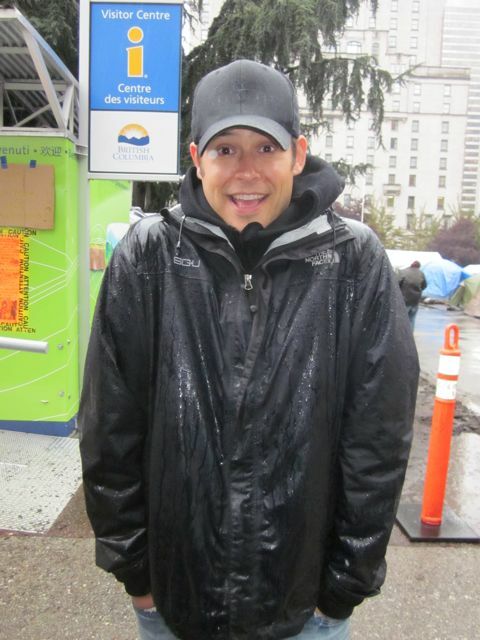 I’m glad you’re back in Vancouver for your sake as well as ours. I’ve missed seeing Ashleigh and Ivon and Lawren and Rob and everyone in the blog. And you seem much happier. Can’t wait to see next week’s food truck tour. Love that drawing by Tara! speaking of peanut butter sandwiches, did you hear the price of peanut butter is going to go up? 1. Watching the SGU clip from yesterday (I was able to see it at work) made me really miss the show. Stooopit ratings! 2. Psych is starting off its season with the best two episodes, ever! Next one looks just as promising. I sure do love this show. 3. Had a little ‘campfire’ in our back yard tonight – a little send off for my sister who leaves for Florida tomorrow. Nice, relaxing, and a great reminder why I love the north and the change of seasons. The 16-year old Lagavulin didn’t hurt, either. 4. Okay, that’s all I got. Nites, sir! I ate a lot and put on a waight. What PONYTAIL said! – AKEMI looks FAB!! Oh I love peanut butter and banana sarnies! 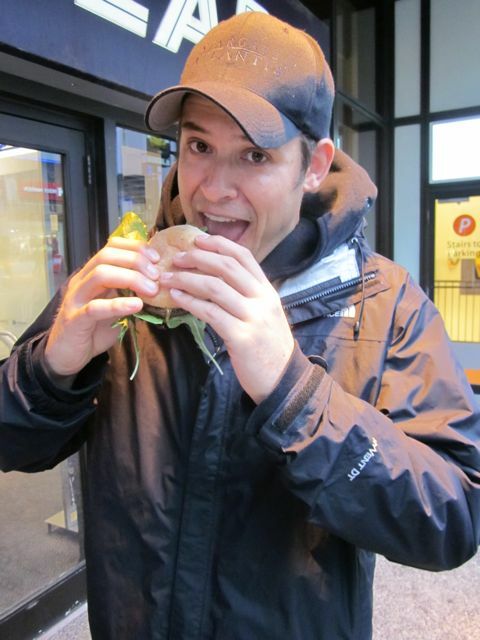 Akemi, do not try to eat like Joe. I truly believe he either is secretly bulimic or has an alien living inside him absorbing the food. Any normal person would weigh 800 pounds and be dead with heart or artery blockage. Thanks a lot for the video of Brian J. Smith jumping all around in SGU that you posted 2 days ago Joe. Yeah this is pretty priceless, and I was doing the same thing at almost all episodes. I know that Stargate Universe wasn’t really for the casual viewers, but how was it awesome for those of us that were invested into the characters !! Many times I really felt like my hand going through the screen to reach out characters. I did beat the crap out of Rush in the same time than Young, the adrenalin was there, and this is so very unique in a TV show, to feel the emotion of the characters, because its so well written, because it’s so well played, with the soundtrack stunts and VFX at that same exceptional level of quality. I pity the casual viewers that are consuming TV shows like fast food. It’s so sad. You got to make an effort to follow a story, you got to be involved in the characters fate, you got to care about them its the only way to get a genuine emotion through the TV screen. Otherwise its quickly consumed and quickly forgotten, there is no passion and no taste. Finally, I would like to say that awesomeness is also defined by a beginning, a middle and an end. When I say that, I mean that nothing is infinite, nothing is forever and you care for a show because of its limits. What I am saying is that quality doesn’t mean a show should last forever. British writers somehow found a solution to this issue: they don’t hesitate to kill the protagonists, sometimes even THE protagonist! Primeval continued without Nick Cutter past season 3 (too funny the show is named after Nick Cutter in the French version Nick Cutter et les Portes du temps). Every 4-5 years, the Brits also kill The Doctor, and this since the 60s. This is also why I usually watch British scifi eyes closed. I know its going to be awesome and I know no one is safe and the story is just unpredictable. (speaking of which, Matt Smith May Leave Doctor Who… ). Tend to agree with Ivon. I don’t understand why tofu needs to be in anything. It causes inflammation. Who wants inflammation? 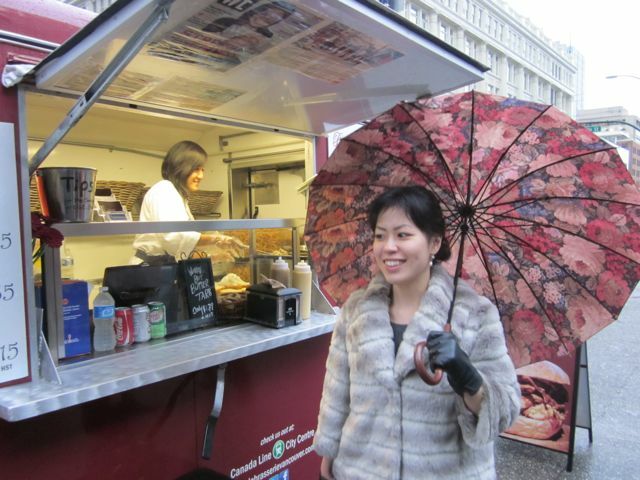 Akemi looks beautiful no matter the weather, and always stylish. Question: Joe: Is Ashleigh no longer vegetarian. She is eating at least fish that we know of. @Das: I hope your sister has a safe trip back home. I’ve had a really crummy day (well yesterday ’cause it is1:02 a.m. here now) How long is a man allowed to have a mid-life crisis? Inquiring minds that want to keep their sanity want to know (meaning me). The saying is the harder you try not to have a birthday celebration, the harder your friends and family will force you to HAVE that birthday celebration. Akemi – you’re looking truly beautiful. Lovely outfit. I’m all excited about it, I’m going to go forth and conquer or at least make a big dent with my own novel starting Nov. 1 Good luck with your novel. PS: If anyone is participating, let me know. We can be writing buddies. My novel started out in the mystery thriller section but my outline is now evolving into a fantasy book. It’ll feature a slightly different twist on Camelot and time travel. If it turns out pretty good then I’ll find an agent, if not, then it’ll be a great experience for me. @Lissa (@americanaussie): I’m doing NaNoWrimo. It will be my second year. Looking forward to it. I’m surprised that Akemi actually finished some of *your* food! That poor girl never seems to eat more than a mouthful. Good for her. She looked terrific. I’m with Ivon on the merits or lack thereof of tofu. The bd clip was cute. And wow, you guys did do an eating marathon. It all looks great. I showed hubby this blog (he never goes online). 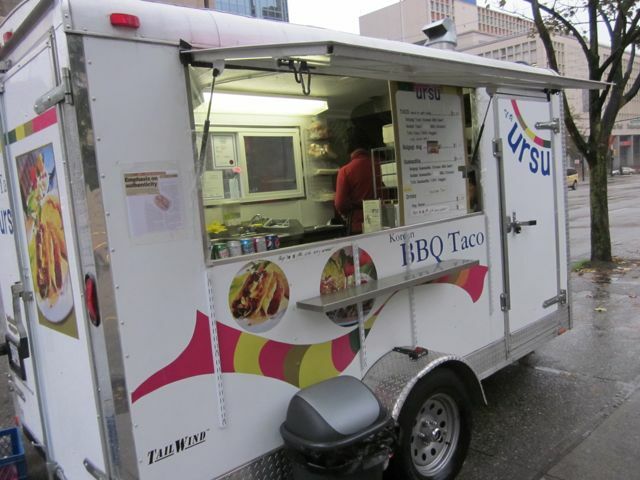 He agreed, a Vancouver truck food trip is entirely a possibility. Hey, we use the timeshare annually, and there’s a nice one downtown…. 2013, because we’re going to Vermont in 2012. Why? Because we’ve never been there. I like a lot your food truck tour. Everything sounds good. Now, I need to go to Vancouvert to taste it. All those food trucks look so good! Akemi: you look like the perfect weight! What is your secret? P.S. 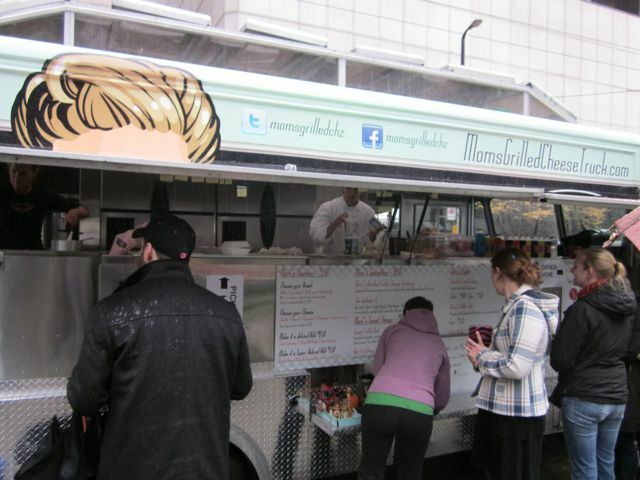 I watched a FoodNetwork show about food trucks in Boston. Did you know they have a Macaron Truck? Those little gems seem surprisingly hard to make. A couple of nights ago I dreamed that I was driving some friends around looking for somewhere to eat, and we stopped at this roadside place that had a whole bunch of food carts. I blame you for this, and the fact that I woke up hungry! I don’t know anything about video technicalities, so perhaps someone can tell me why I can only HEAR the viseo links on this blog, but get no video? I get a black square and audio, but nothing else. Any ideas? Thanks.